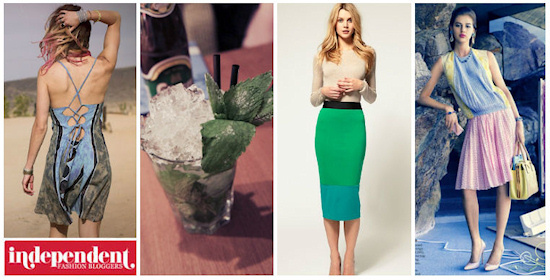 Hi, happy news from IFB, my last blogger featurette got featured in this week's Links á la Mode round-up :) and I even placed first :P and my Mojito cocktail pic was also selected :P Wow! So for this post I thought, I will highlight three new outfit bloggers from this round-up. Looking forward to discovering new awesome blogs! Adrienne's ultimate addiction is writing a diary of outfit stories with a sense of style that is impressively cute and sophisticated. Every OOTD post of the focused blogger has a different theme and in between her cute outfit pictures you will find some cheerful comments and anecdotes regarding the shoot and her daily life. My verdict, pretty addictive! Hey I heard you like the WILD ONES, and a wild one she is. Natalie started her blog only recently, but her outfit pictures look so experienced that you might think she blogs already for a long time. OMG, how I love these crochet shorts for example. Could you ever get too much of these? Camo meets Couture is a new blog of a gorgeous mom, army wife and chocolate connoisseur :P covering a mix of topics including food, fashion, family and fancies ;) In one of Jenee's latest OOTD posts, lovely called Wardrobe Diaries: A Date at the range, the term shooting gets quite literal, featuring a firearm training with a 9mm Springfield XDM Compact ;) How cool is that? Camo meets Lara Croft :) And Happy Mother's Day! Also check out the complete list of featured bloggers below. What is your blogger of the week?